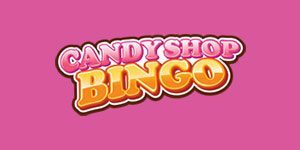 Candy Shop Bingo Casino will then reward you with a bonus (Welcome Bonus is for new players only). The terms and conditions of the bonuses vary between different casinos and might also change over time and between different countries, so it is important to compare the different offers and read the T&C for Candy Shop Bingo Casino before signing up. Launched in 2015 by Cassava Enterprises (Gibraltar) Limited. CandyShop Bingo Casino has quickly become a favorite for many striving to bring an extraordinary bingo experience to players through a unique promotion and a strong loyalty program that rewards players with different benefits such as cashback bonuses, bonus spins, and extra tickets. This has made them a fierce competitor to the many bingo sites out there. The casino is secured with the latest SSL encryption the ensure a secure experience for their casino customers. The casino currently holds a license from the UK Gambling Commission. The site is running on the popular Dragonfish platform that is a favorite among bingo players with their large range of different bingo games. Even though bingo is their main focus they have a good assortment of slots offered as well by the popular game provider NetEnt offering games such as Gonzo´s quest, Starburst among other games. 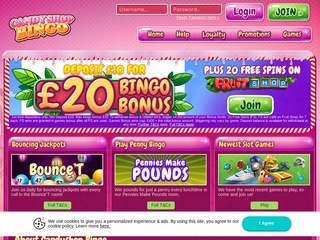 Even though the site is mainly focused on bingo games they do have a small assortment of slots provided by Dragonfish and Net Entertainment. Even though their assortment of table games is small they do offer variations of classic table games such as Baccarat, video poker, and Roulette. This is where Candy Shop Bingo shines, it is their great bingo titles provided by Dragonfish that is the allure of the casino to many. Candy shop bingo provides all the most common banking solutions to provide customers with a smooth banking experience on the casino including, Visa, MasterCard, PayPal, Entropay, Neteller and Paysafecards. Candy Shop Bingo offers 24 hours a day live support throughout the whole year, with an experienced support team that’s always ready to answer any questions you might have. The support team is also available through mail or phone. If you have general questions the casino also provides an extensive FAQ with the answer to all the most common questions casino players tend to have. The casino shows social media presence on Facebook.